PRAYER Can Help Solve Your Problems! Many spend hours in prayer with no apparent results. Troubles seem to continue to mount. Why? Here is the surprising answer from one of our local elders from Headquarters. THIS has been a critical season for most of the world — and for many of us! Serious and strange viruses and respiratory ailments have undermined the stamina and health of some! Unemployment has sapped the ability to provide for our own families in certain cases! Persecution has threatened the peace and security of some of our loved ones! Those who HAVE escaped these troubles are wondering why the others HAVE NOT! What is wrong? Why do problems seem to stalk continually, not only the world, but the people of God as well — the VERY PEOPLE God has CALLED OUT of a very sick and confused world? God has promised to bless, to prosper, to make life full, abundant and a joy to every one of us here and now! In some cases that promise has not materialized. Why? In one way or another it has affected the entire Church of God, the Body of Christ. When one member suffers, the whole Body suffers (I Cor. 12:24-27). In visiting and counseling with many members, we have found a common condition that reveals a vital key to most of these unpleasant circumstances! That key? — OUR PRAYER HABITS! Yes! FAULTY prayer habits are a primary cause of these serious problems in God's Church! One man, after becoming embittered against the Church, insisted he was praying more at that time than at any time before. Yet he left the Church! Others, too, have claimed they had never been closer to God in their prayer habits than at that particular time! COULD THIS BE TRUE? Lack of understanding this subject could be fatal to our own spiritual development! We need to examine ourselves! Many of us accept teachings of Christ's Church readily — UNTIL one of those decisions strikes at the core of some aspect of our own lives. Then we begin to doubt the wisdom of Christ, of God's ministers! It becomes easy for us to forget that they are ordained, and placed in office BY GOD for the express purpose of perfecting the saints — the work of the ministry — till we all come to the UNITY of the faith and knowledge of the Son of God, to the PERFECT man (Eph. 4:12-13). Something is radically wrong when some, who claimed to be "close to God in prayer," suddenly are found to be on the way into the lake of fire! Of these He said, "Not every one that saith unto me, 'Lord, Lord,' shall enter into the kingdom of heaven" (Matt. 7:22, 21). It is possible to claim to worship God diligently, and to do so in vain! Christ could not have said so, otherwise! An example of a wrong attitude was innocently expressed by a little three-year-old girl at a buffet dinner recently. She stood obediently and politely with bowed head along with her elders as God's blessing was asked on the food. At the word "Amen!" she gave a sigh clearly audible throughout the room. To her mind the prayer was a necessary, BUT IRKSOME, prelude to partaking of that delicious food! Is prayer merely a superstitious smattering of words that are quoted piously before commencing on certain phases of daily duties? Prayer must be made with a proper attitude of mind, with diligent application, with real fervency, and a proper knowledge of what to pray for! Where do some fall short, that they continue to be plagued with very real misfortunes? Some ARE falling short somewhere, and in most every case it is in prayer! How many of you, when prayer is being offered up to God by others, can summarize that prayer at its close? Do we really focus our attention fully on the prayer? or is our attention distracted by other interests? To some, prayer seems to be an irksome and a boring duty — a required ritual we conform to, but are secretly happy to have done with. Prayer has not become the real and living blessing to us God intended it to be! It is vital that we examine our prayers as God sees them! Here is a typical problem that ministers are often called upon to help with. One couple had been working together providing for their fair-sized family. Everything seemed to move along fairly well for a time. Suddenly, without warning, the man lost his job! His wife fell seriously ill and recuperated slowly over a period of weeks. Week after week passed. Their appeal for help from the ministers of the Church brought to us a sorry picture. Not only unemployment, but mounting bills, prospect of eviction from a decent home, utterly rebellious children, and a husband and a wife on the verge of going their separate ways! When asked if each had fervently prayed one hour a day over these terrible problems that had developed, the answer in each case was a sheepish "No!" Pursuing this further, the ministers found that even before he had lost his job this man had devoted no more than one or two hours to prayer EACH WEEK! A vital taproot of their problem had been found. Brethren, it is vital that we go to our heavenly Father in prayer every day! This could be the taproot of our problems! Why is prayer so very important? Prayer is conversation. Not something given by rote — repeated over and over monotonously! It is conversation with our Maker — our Father in Heaven. Conversation, in this world, helps one person to understand, and to come to love another better. How often have we formed bad first-impressions of certain people, and then, as a result of conversation with them, found them to really be desirable friends! The "Christian" world we have lived in has given most of us a false first-impression of God. It has instilled in our minds a picture of a harsh, stern God — a God that seemingly loves to see us suffer under the battering of storms, weather disasters, war, famine, disease, unemployment. And a God who is inaccessible to us — who has gone afar off from our appeals! Through conversational prayer we come into direct contact daily with the true God. We come to KNOW Him as He is. Prayer dispels that first-impression foisted off on us by the world. A real, comforting love develops, and a new and intimate knowledge of the very mind of God results. We need to learn to talk over our problems with Him as we would desire to do with our own earthly father of the flesh! But how to develop such a proper, intimate, and acceptable pattern of prayer seems to perplex many. We should YEARN to establish such a contact — to know God better! SCHEDULE YOUR TIME for the activities of the day, including a time for prayer — a regular time. An hour, or at least a half-hour to begin with, is almost an essential consideration! The period of time set aside for prayer should be the hour of the day we are most mentally alert — BEFORE the problems of the day develop! "But seek ye FIRST the Kingdom of God, and His righteousness; and all these things [our needs] shall be added unto you" (Matt. 6:33). Some have claimed they could pray just as effectively as they go about performing their daily work. THIS IS NOT TRUE, unless they FIRST have had a period of prayer ON THEIR KNEES! The fruits of such people have proven this fact. How should we pray? Is there a recommended position of prayer? "That at the name of Jesus EVERY KNEE SHOULD BOW..." (Phil. 2:10). Every knee should bow before God. The world pays homage to an earthly king by kneeling before him on ONE knee. We pay homage to the King of all the universe by kneeling before Him on BOTH knees. Read II Chronicles 6:13; Daniel 6:10; Luke 22:41; Acts 9:40; 20:36 and others. These are our examples! Again, it should not be a memorized prayer! Many turn to Christ's instruction to His disciples in Matthew 6:8-13 and quote the words in their prayer day after day. Note, however, that He said, "After this MANNER [pattern] therefore pray ye..." This was given only as the skeletal framework around which to build our own prayer. Jesus did not mean "pray THIS" — He meant "pray THUS"! Jesus' pattern of prayer is very important! Note that Christ began by glorifying God. One fourth of our prayer should be given over to glorifying God — to magnifying His majesty, power, glory and love! We can do this only by studying His Word — studying David's examples in the Psalms — asking God, at times, to accept some of these Psalms as our own words of praise and thanksgiving. Realize how completely dependent we are on Him for our food, shelter, clothing and the very breath of air we breathe! Let our minds drink in of His greatness, His mercy, His sustaining power. We are a thank-LESS generation of people. We need to change our ways! We need to guard against the "gimmes" in our prayers! Study of all the examples of prayer given in our Bibles will help us immensely. We should learn who God's ministers are, where they are working, and the problems they are facing in their particular areas of the world. We should certainly realize that the great and primary commission of this Church is to preach the Word of God faithfully to all the world (Matt. 24:14; 28:19-20). We should pray that new radio and then television facilities will be opened up to "The WORLD TOMORROW" program, at better times, and in areas not yet reached. And that this gospel will pierce the hearts and the minds of every listener. Study the Bible and the literature that is sent out. If you don't understand something, jot it down in a notepad, or as part of a special prayer list as a reminder when you go to your place of prayer. Ask God to answer it through the broadcast or the magazines or Correspondence Course and through the Bible. Some think that any thought that pops into their minds is God's answer when it is only their own impulse. God answers through His Word and His ministry. Pray for more consecrated laborers to be led into the work of God. There is a tremendous need for the right calibre men and women to do the work that is piling up (John 4:35, and Matt. 9:37-38). Prayer is a private matter, not a public matter for your unconverted relatives to notice! "And when thou prayest, thou shalt not be as the hypocrites are: for they love to pray standing in the synagogues and in the corners of the streets, that they may be seen of men. Verily I say unto you, They have their reward. But thou, when thou prayest, enter into thy closet, and when thou hast shut thy door, pray to thy Father which is in secret; and thy Father which seeth in secret shall reward thee openly" (Matt. 6:5-6). We can help unconverted members of our families by leading them in family worship IF THEY PERSONALLY SO DESIRE, but AFTER we have ALREADY had our own! We need to remain in an attitude of prayer throughout the day. David, a man after God's own heart (Acts 13:22) said, "Evening, and morning, and at noon, will I pray, and cry aloud: and He shall hear my voice" (Ps. 55:17). We, too, should follow this example of David, who has his guarantee of being in the Kingdom of God! WE SHOULD ASK GOD'S HELP TO GUIDE US IN PRAYER. He will lead us to have real concern and love for all the brethren, for the ministers, and His work. We may even forget our own needs in losing ourselves in these other interests — but God will not forget OUR needs! IF WE EACH PRAY ONLY FOR OURSELVES, ONLY ONE PERSON PRAYS FOR EACH OF US. BUT IF WE ALL PRAY FOR EACH OTHER THEN, THOUSANDS PRAY FOR EACH OF US. Our prayer life will truly come ALIVE as we learn to improve our attitudes. If we are continuing to have troubles, sickness, discouragement, unemployment and persecutions, we need to examine ourselves. God is not at fault! "But YOUR INIQUITIES have separated between you and your God, and YOUR SINS have hid his face from you, that he will not hear" (Isa. 59:2). LISTEN TO GOD'S CORRECTION! THOSE WHO PRAY AND REFUSE TO OBEY WHAT GOD SAYS THROUGH HIS WORD AND HIS MINISTERS, cut themselves off from their Creator and worship God in vain. Don't let this happen to you! This, then, is the key to overcoming our problems. God WILL hear and answer our pleas as he did David's. The answers will begin to come as never before, and real happiness, and a fruitful life of service to God will open before us. We shall find that we really know God as our Father in Heaven. Each moment spent in prayer with Him will be a moment of real joy to us! 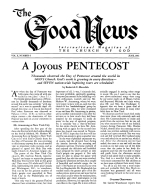 We should all read, if we haven't done so, Mr. Roderick Meredith's reprint article "The Answer to Unanswered Prayer." "Great peace have they which love thy law: and NOTHING SHALL OFFEND THEM [cause them to stumble]!" (Ps. 119:165).